Captain America: The Winter Solider hits theaters this weekend—and I will be seeing it. As the daughter of a Marvel comics fan (an O.G. 1960’s Marvel fan), and a girl who flocks to the midnight showing of nearly every Marvel and DC movie, I cannot wait to see Captain America 2. But honestly, I could care less about the actual Captain America. He’s cool and all, but it’s the Black Widow (badass Scarlett Johansson) and the Falcon (handsome Anthony Mackie) who I really want to see. Yes yes, it’s about time Marvel brought some diversity. 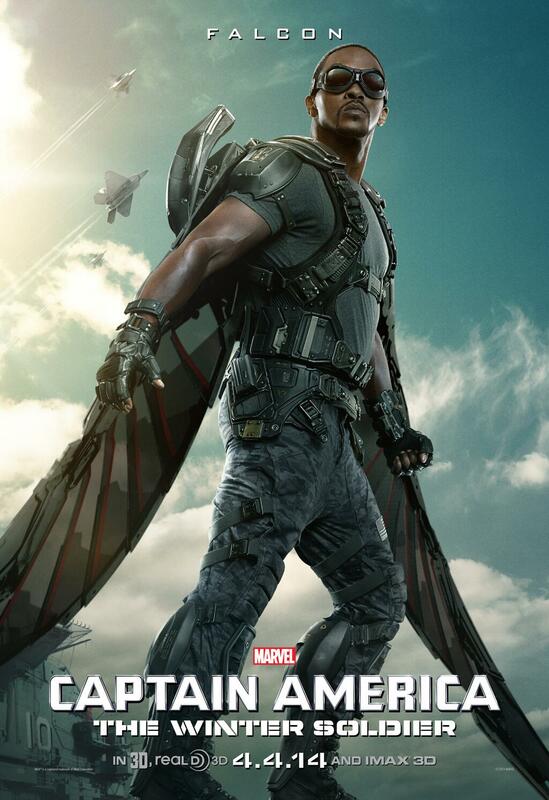 If you haven’t heard, this movie introduces the Falcon one of Marvel’s first black Superheroes. In the movie, he’s a military soldier who a wears a high-tech winged suit that allows him to fly. 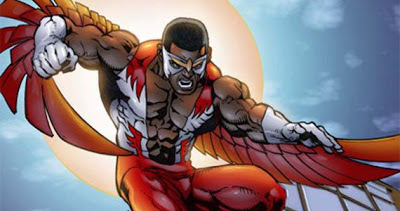 The original Falcon was introduced in 1969, and fought alongside Captain America and the Avengers. We also saw a bit more color in the casting of Fruitvale Station’s Michael B. Jordan as the Human Torch in the upcoming Fantastic 4 movie. Of course, angry racist fans masking themselves as “comic book purists” had a lot to say about how the Human Torch is supposed to be white, how producers should stick to the historical (fictional) truth and blah blah blah. People have said that about all the black characters in The Hunger Games, Catching Fire, and the remake of Annie. I think we’ve all grown tired of the BS. In 2014, it’s not a sin for the good guys in the movies to be black. Quite frankly, America needs black superheroes. Seeing someone other than the typical strong white male saving the day is bigger than just “diversity on the screen.” Media representation has always been an uphill battle for people of color. It’s a historical struggle: from the white actors in blackface in the 1800s, to the mammies and sambos of antebellum films, to the bitchy and irrational black women of Tyler Perry’s films. We’re still struggling for representations that don’t exemplify nasty stereotypes. So when I see a black superhero in a movie, I jump for joy. Because when Anthony Mackie and Michael B. Jordan appear on the big screen, they won’t be playing thugs, drug dealers, criminals, the characters who die first, or anything Tyler Perry and his white imagination can drum up; instead, they will be the ones fighting crime and saving the world. When it comes to media representation, skin color does matter. It matters in a similar way that having black president matters. Why do you think all the elders that lived through the Civil Rights movement were crying after Barack Obama’s victory in 2008? Why do you think people celebrated the first Indian-American Miss America? These moments show historical turning points, when someone goes up against centuries-old racial tensions and comes out victorious. It’s extremely important that children (and adults for that matter) see reflections of themselves in all aspects of society, especially in the heroes of American culture. So that we can tell our young black daughters that not only can they stop a mutant vs. human war with their superhuman abilities, like Storm, but also, they can that they can run for president or win a seat in congress with their strong determination and intellect, like Shirley Chisolm. Of course, Marvel’s got a long way to go. Sure they get a few points for casting Jordan, Mackie, Halle Berry (X-Men’s Storm), and Samuel L. Jackson (Avenger’s Nick Fury). But they need to do more. I can’t wait until Marvel decides to feature another black woman superhero. Right now Halle Berry’s holding it down as Storm, but that’s pretty much it. While they’re at it, they must cast other people of color as well. The world’s more colorful than just black and white. Isn’t assuming that people who complain about the Human Torch being played by a black man are racist, itself a little bit racist? Forget for a second that the character has historically been depected as being white. He is also depected as beinf Sue Storms biological brother, yet in the film she is played by a white person. If you are going to change one, and stay true to the source material, you have to change both. I think you underestimate how obsessive some comic book fans actually get over the details of their favourite characters. Sure there probably are some people griping about it who are legit racists. But given how touchy comic fans are…I wouldn’t be surprised if the actual racists were in the minority on this issue. I agree with you however there needs to be more diversity, and actually all it takes is a quick google search to realise there are alot of under promoted black super heros out there, providing plenty of source material for the genre. I really don’t see why Hollywood, or the publishing companies aren’t pushing for these stories to be brought to film. Given the mass popularity of the genre, its a guaranteed money maker for the film studios, and a major film would reinvigorate interest in the characters and boost sales for the publications. A dictionary definition explains that racism belief that all members of each race possess characteristics or abilities specific to that race, especially so as to distinguish it as inferior or superior to another race or races. The key word here is FICTIONAL. Comics are NOT REAL. So are you telling me that even in this fictional world, the Human Torch cant have a multi-racial family???? That’s pretty small-minded thinking–especially for such a cool genre. I mean, damn, even in the real world, there are such things as adoption and multiracial families. Also, in “Cinderella” the 90’s musical staring Brandy Norwood, the people casting for roles casted members of families Asian, black, white, etc. The cast was extremely colorful–and they could do that because they imagined a world where everyone wasn’t white. Comic book purists–I mean racists– can’t seem to image a world where the characters are not white. That is racist.